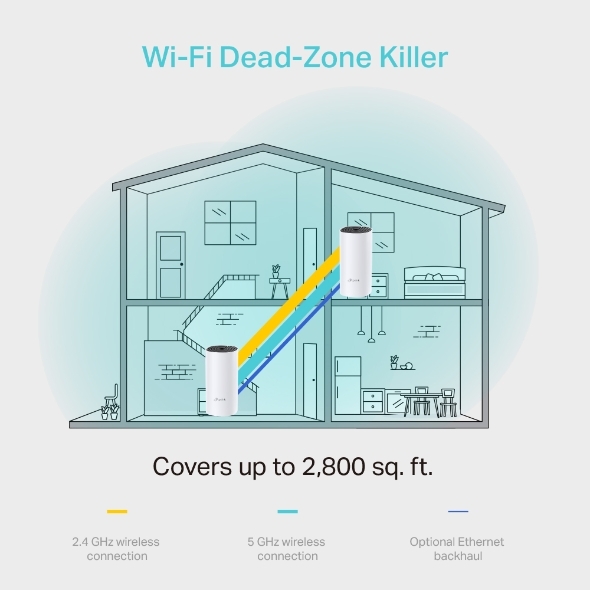 Deco uses a system of units to achieve seamless whole-home Wi-Fi coverage — eliminate weak signal areas once and for all! With advanced Deco Mesh Technology, units work together to form a unified network with a single network name. Devices automatically switch between Decos as you move through your home for the fastest possible speeds. 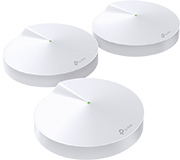 A Deco M4 two-pack delivers Wi-Fi to an area of up to 2,800 square feet (EU version)†. And if that’s not enough, simply add more Decos to the network anytime to increase coverage. 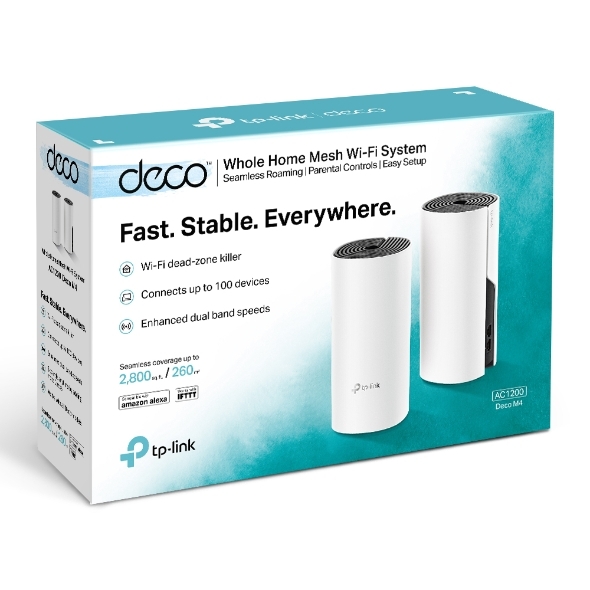 Deco M4 provides fast and stable connections with speeds of up to 1167 Mbps† and works with major internet service provider (ISP) and modem. Deco can handle traffic from even the busiest of networks, providing lag-free connections for up to 100 devices†. Parental Controls limits online time and block inappropriate websites according to unique profiles created for each family member. Deco M4 uses TP-Link Mesh technology to cover your entire home in powerful Wi-Fi. 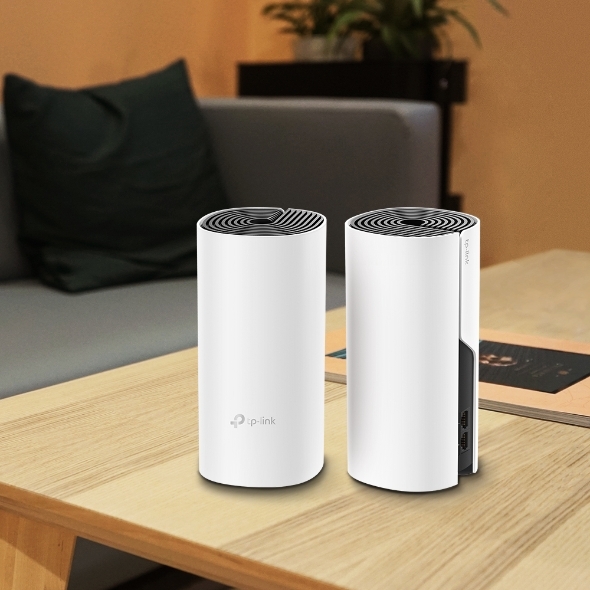 Multiple units seamlessly work together to create a home network like nothing you’ve ever experienced. Deco M4 is the simplest way to guarantee a strong Wi-Fi signal in every corner of your home up to 2,800 square feet (2-pack, EU version)†. Wireless connections and optional Ethernet backhaul work together to link Deco units, providing even faster network speeds and truly seamless coverage. Want more coverage? Simply add another Deco. 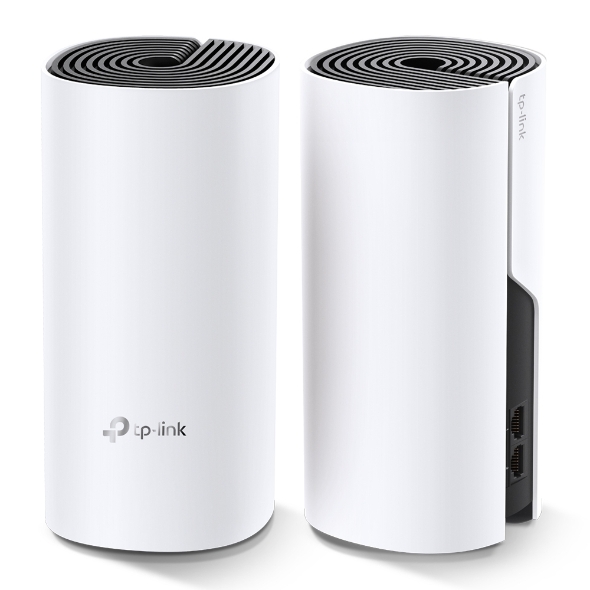 TP-Link Mesh means Deco units work together to form one unified network. Your phone or tablet automatically connects to the fastest Deco as you move through your home, creating a truly seamless Wi-Fi experience‡. 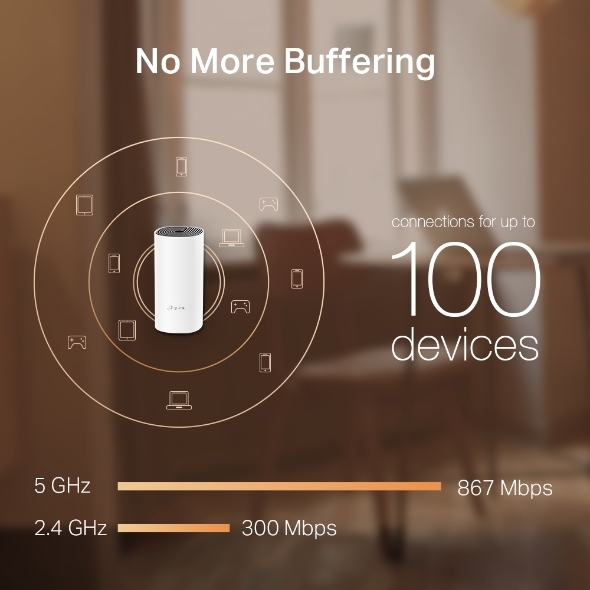 Network speeds three times faster than previous generation routers, thanks to 802.11ac wireless technology, make Deco capable of providing a lag-free connection to up to 100 devices†. Flexible and multifunctional, the Deco M4 includes a variety of features allowing it to serve as a router or access point. Just choose the mode for your actual network demands and experience the maximum wireless flexibility. *Range Extender mode requires to update the firmware to the latest version, which will be released soon. 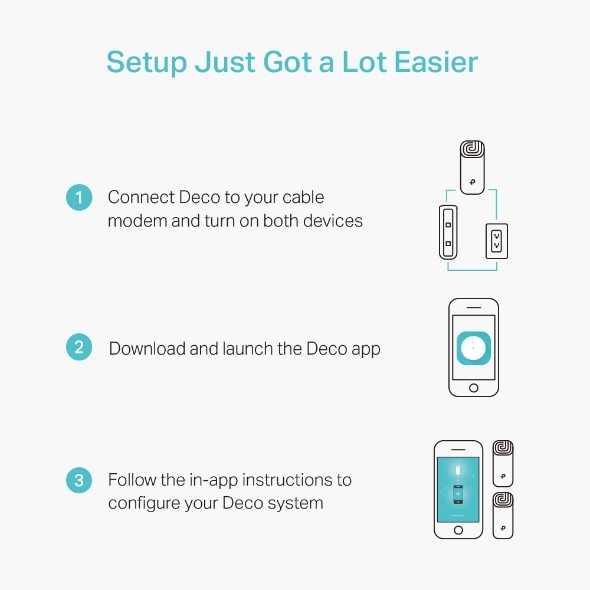 Installing Deco M4 is fast and easy. Just unpack the system, download the Deco app and follow its onscreen directions. Manage your Wi-Fi at home or away in the Deco app, including seeing the connected devices, prioritizing your devices, setting up a guest network and more. Pair with Alexa to control Deco M4 with simple voice commands. Enjoy the convenient life. keep your children safe while they’re online. Easily create a profile for each family member and set custom time limits and online time allowances. Keep your family safe online with one-touch security settings that block websites based on age-appropriateness. Set limits on how much time each person in your family can spend online. Check out which sites your children visit and how much time they spend on each to ensure your children are safe while they’re having fun online. Take a break from Wi-Fi for dinner and family game nights. Just tap a button to suspend internet access for everyone in your home. anytime by simply adding more Decos. †Capability to connect 100 devices is based on testing using a mixed combination of devices. Maximum wireless transmission rates are the physical rates derived from IEEE Standard 802.11 specifications. Range, coverage, and maximum quantity of connected devices are based on test results under normal usage conditions. Actual wireless data throughput. wireless coverage, and quantity of connected devices are not guaranteed and will vary as a result of 1) environmental factors, including building materials, physical objects, and obstacles, 2) network conditions, including local interference, volume and density of traffic, product location, network complexity, and network overhead, and 3) client limitations, including rated performance, location, connection quality, and client condition. 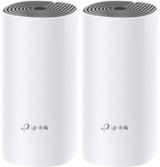 ‡Clients need to support 802.11k/v/r and may require additional set up. Performance may vary depending on the client device. §Deco M3W will be released soon. whether you're in the basement, garage or yard. Deco units work together to form one unified network. Your phone or tablet automatically connects to the fastest Deco as you move through your home, creating a truly seamless online experience. Support for IEEE 802.11r as well as 802.11k/v mean switching from one Deco to another is so smooth it’s unnoticeable, even during streaming. matter where you are in the home. Decos to make sure you stay online. Powerline connections utilize your home's electrical circuit to link Decos, bypassing even the thickest of walls and ceilings. 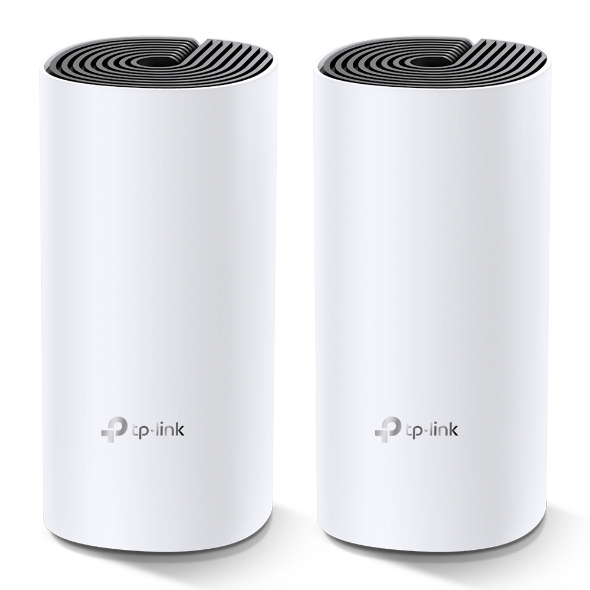 The combination of powerline and wireless connections achieves up to 60% faster network speeds compared with only wireless connection. 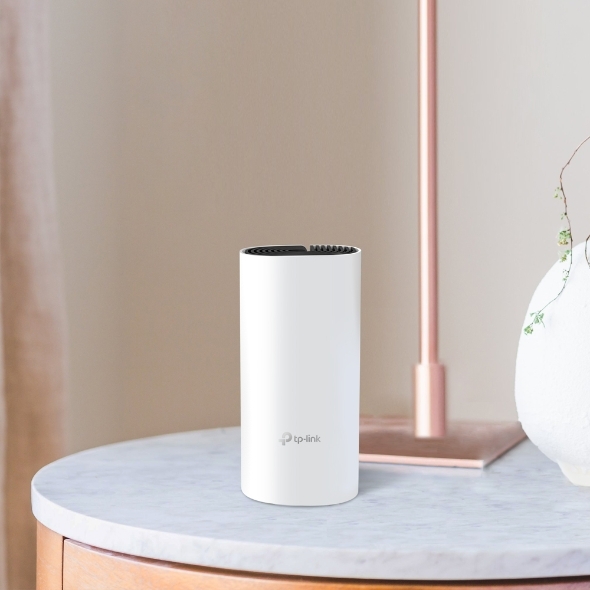 Unlike traditional smart hubs, TP-Link Mesh Technology provides whole-home IoT coverage with Wi-Fi, Bluetooth and Zigbee integrated into a single system. Enjoy the magic of your smart home in every room with TP-Link Mesh Technology. Say goodbye to countless hubs. Deco Network Management at Your Fingertips! The Deco app provides the easiest way to set up, manage and monitor your Deco Whole Home Mesh Wi-Fi System through your iOS or Android devices. Unbox Deco, install the app and then simply follow the on-screen directions. Deco app will take care of the rest and get your network up and running in minutes. Follow the in-app instructions to configure your Deco system. Deco makes it easy to manage your Wi-Fi from anywhere, whether you’re on the couch, at work, or anywhere in between. View the working status of your network, check the connected devices and get all the features your router offers. The Deco app manages all your Deco networks and devices connected to your Deco Wi-Fi. View a list of your connected devices with the ability to pause and resume internet access, test the internet speed and prioritize or block the devices. Remotely take control of the network with a tap of your phone—no matter where you find yourself. Simple, intuitive parental controls make it easy to keep your children safe while they’re online. Easily create a profile for each family member and set custom time limits and online time allowances. Assign devices to profiles so rules extend to individual devices as well as family members. Keep your family safe online with one-touch security settings that block content based on age-appropriateness. With Insights, you can check out which sites your children visit and how much time they spend on each. It’s a great way to know your children are safe while they’re having fun online. blocked content, security threats and more. Have questions about Deco? Help is always just a click away. Find the answers in Deco app and don’t hesitate to contact us with just a simple click. Notes: App interfaces and functions may vary slightly based on the app version and Deco models.